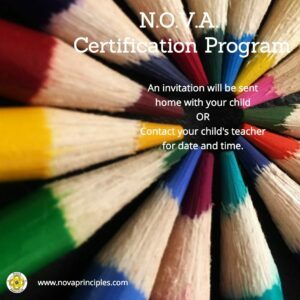 This special Certification Program is held to award students who complete all of the requirements of the N.O.V.A. program, a Certification of Achievement award. Some students have also earned and will receive other special awards such as, the Project N.O.V.A. Award, the N.O.V.A. Pack Award, the N.O.V.A. Constitution Award, and the Super N.O.V.A. Award as well. Please show support to your child by attending this Program! The last requirement for parents to become an “Elite” member of the N.O.V.A. Parent Pack, is to take a quiz. To take this quiz, go to www.novaprinciples.com, and log in. Then click on the “Courses” link, and then the “N.O.V.A. Parent Pack Documents” link. If or when you have completed all of the requirements to become an “Elite” member of the N.O.V.A. Parent Pack, please log in at www.novaprinciples.com, and click the “Courses” link, then the “N.O.V.A. Parent Pack Documents” link, and print off a copy of the “N.O.V.A. Parent Pack Certification” Award for yourself. Congratulations for this achievement!